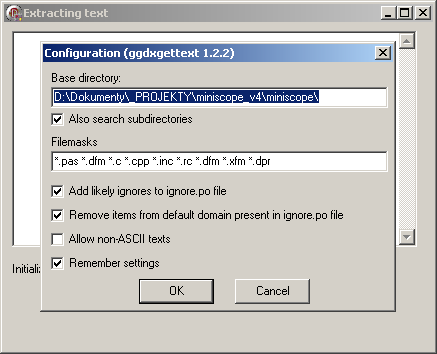 Miniscope v4 user interface can be localized with GNU gettext Delphi and C++ Builder (dxgettext) tools. It allows to add or modify translation without changing source code and recompiling. Miniscope is non-Unicode application. When testing translation (running program with other than English language selected) you may have to change "Regional and Language Options"/"Language for non-Unicode programs" to in order to correctly display characters outside basic ASCII set. In order to start you have to install dxgettext package, preferably 1.2.2 version. Use "Integrate with desktop environment" and "Modify path" options when installing. Integration with Windows Explorer can be also fixed later using shortcut created in Start menu. Second tool needed is translation files (.po) editor. In general any text editor, preferably with unicode support might be good, but I would recommend Poedit. It also creates more effective .mo file when saving text .po file.